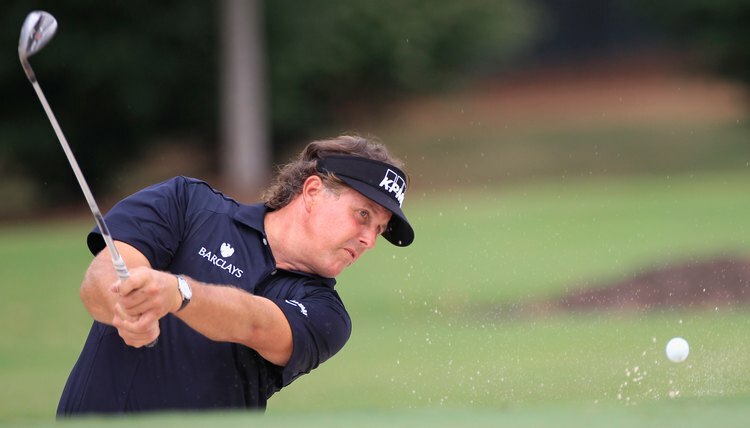 PGA Tour player Phil Mickelson is considered a master with the wedges. Golfers used to have one or two wedges in their golf bag -- the pitching wedge, which is included in most sets of irons, and the sand wedge. In the last 20 years, club manufacturers have strengthened the irons by decreasing loft and, thereby, creating more distance with each club. In other words, a pitching wedge has a loft that is similar to that of an older 9-iron. The loft of the sand wedge, however, has not changed. This readjustment of iron lofts and the desire for more lofted shots around the green led to the development of the gap and lob wedges. The basic pitching wedge has a loft of 46 to 48 degrees. It is designed for full shots when the 9-iron would create too long of a shot. The distance varies from one golfer to the next, but typically, amateurs hit the pitching wedge from 80 to 110 yards. This wedge can also be used for half-swing pitch shots and low chip shots around the green. The sand wedge, as the name implies, is designed for use in the sand areas, called bunkers, but like the pitching wedge, you can use it for full-swing shots off the turf and for short shots around the greens. The sand wedge typically has a loft ranging from 54 to 58 degrees. The sand wedge an angled sole, measured in degrees of "bounce," that performs better in fluffy sand. The gap wedge, also known as the approach wedge, got its name because it fills the distance gap between the pitching wedge and sand wedge. The loft is similar to that of an older pitching wedge -- between 51 and 53 degrees. The lob wedge is the most lofted club in a golfer's bag, typically with a loft of 58 to 60 degrees, although some club manufacturers are offering lob wedges with up to 64 degrees of loft. The lob wedge may also be identified as the L-wedge or UL-wedge, for the ultra lob or 64-degree wedge. It is designed for high shots around the green, particularly if the golfer needs to hit over an obstacle and have the ball stop quickly. What Is the Loft of a PW?